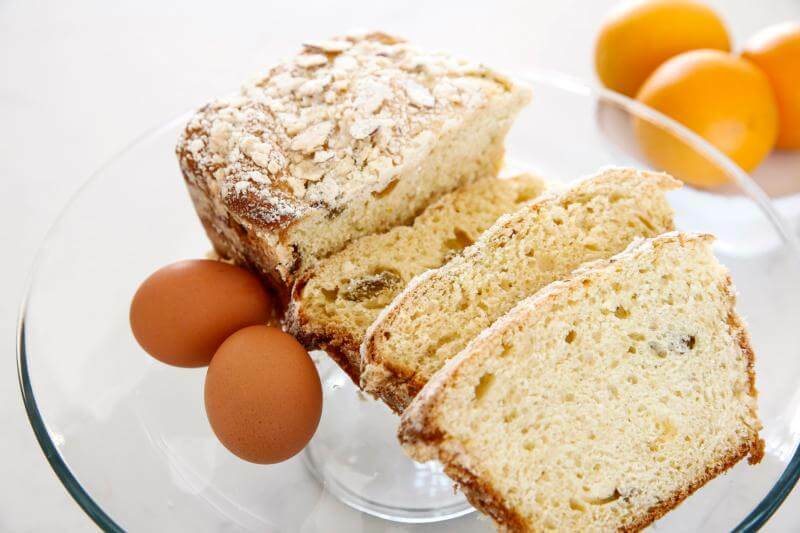 Photo Credit: CNS/Nancy Wiechec - Polish placek is the perfect Easter bread, rich with eggs, butter and milk with a hint of orange and the sweetness of golden raisins. Baking this particular bread for Easter is a Slavic tradition that has been adopted by immigrants and others in the United States. Every Holy Saturday my parents would pack a wicker picnic basket with Polish fare — homemade sausage, ham, colored eggs, potato bread, sweet bread, horseradish and a few other items. When it was all secured with a white linen cloth, we’d jump in the car and head to church for the traditional Easter basket blessing. In the sanctuary there would be others with baskets containing similar delicacies. Church never smelled so good! The blessing is a Slavic tradition that has been adopted by immigrants and others in the U.S. In early times, Poles took their fasts and their feasts very seriously. Not only was meat forbidden on days of fasting, but so were eggs, cheese, milk and sweets. Before Lent, Poles would clear their cupboards of sugar, flour, jams and yeast. So as not to waste anything, they made paczki, fried and filled pastries that resemble donuts. Then, just before Easter, they would gather fresh ingredients and make savory and sweet dishes for the celebration of the Resurrection, of life anew. Breads were always in the Easter mix and filled Polish kitchens with memorable aromas. One of our family favorites is Easter placek, rich with milk, eggs, butter, a hint of citrus and a crumbly sweet streusel. It looks like a quick bread, but it is not. It has yeast, plenty of it, and a coarser crumb. In a large bowl, dissolve the yeast in the warm milk with the sugar. Let stand until foamy, about 10 minutes. Stir in the flour. Cover the bowl and let the sponge rise until doubled in size, 30 minutes to an hour. In mixing bowl, cream together the butter and sugar, then add the eggs, one at a time, and beat until fluffy. Add in the salt, nutmeg, vanilla, orange zest and 2 cups of the flour. Beat well. Add the risen sponge along with the last 2 cups of flour and the raisins. Use the dough hook on a mixer and mix for 5 minutes. The dough should be smooth but still a bit sticky. Place the dough in a large buttered bowl. Cover and let dough rise until doubled in size, an hour to 2.5 hours. Cut the butter into the sugar and flour until small crumbs form. Mix in the almonds. After the dough has risen, divide it among four greased loaf pans, cover each loaf with some of the crumb topping. Cover the pans with a dry kitchen towel and let the loaves rise until double in size, 45 minutes to an hour. Preheat oven to 375 F and bake loaves for 30 minutes or until golden on top. Cool the pans on wire rack, then invert them and cool completely. Placek is best eaten fresh within a few days, but loaves can be wrapped in plastic and frozen.